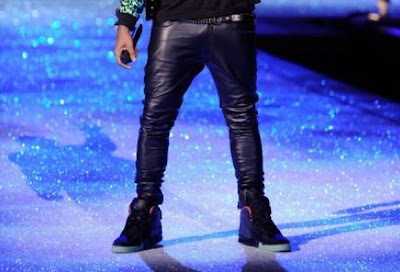 Kanye West, matched up his leather pants with some dope black Nike Air Yeezys. 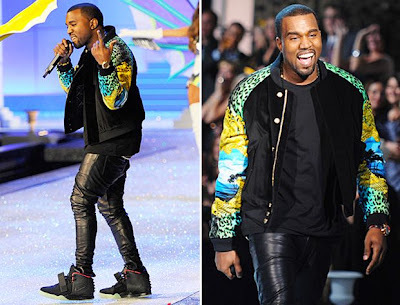 -The AIr Yeezy is one of the most anticipated sneakers of our time! Just an hour after Kanye West’s performance at the Victoria’s Secret Fashion Show aired, photos of the upcoming Black / Pink colorway of the Nike Air Yeezy 2 began to surface. The Nike Air Yeezy 2 is looking like it’s ready to hit retailers and is getting fresher by the photo. According to Modern Notoriety, Kanye West has been wearing the Nike Air Yeezy 2 Black / Pink for quite sometime now so we can definitely expect the Black / Pink colorway to be the first Nike Air Yeezy 2 to be released.